When Mat talks about what comes with the HW40 he never says anything about the SS Record Weight and P Ring ,,Is that part of the 15K package ??????? 10ovr wrote: When Mat talks about what comes with the HW40 he never says anything about the SS Record Weight and P Ring ,,Is that part of the 15K package ??????? Yes, the 40DD comes standard with both the centre weight and periphery ring. 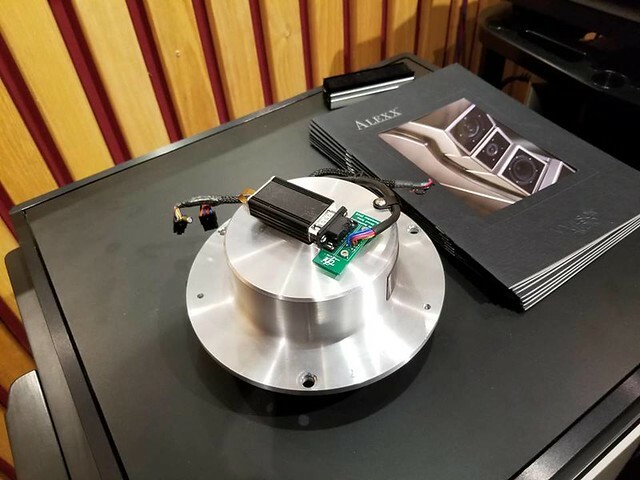 I can’t believe no one has posted here about the sound of this new turntable at the Capitol audio fest this past weekend! This table is nothing short of incredible. It has perfect stability, perfect pitch, zero smear. The VPI room was expertly set up with Wilson Alexx speakers, Krell application, VPI phono stage, and a Soundsmith Hyperion cartridge. The records were really flowing on Saturday night, and there was a stream of sides from maybe 6 PM through 8 PM that cemented this room into my mind as by far the best sound in the entire show. One record in particular really grabbed me, and that was the new intervention records release of Joe Jackson’s live Summer in the City album. OMFG. I have this album in my own collection, and it sounds pretty great on my system as well, but this was out of this world. Yes, the Wilson speakers are truly fabulous and live up to their expectations in spades, but without the right source material and reproduction, this recording would never have sounded as great as it did. It was truly like being at a Joe Jackson concert, without any exception. I stayed in my seat for a good hour and a half without moving as Matt flipped records. One of the folks in the audience had a record with him called Snarky Puppy, and that was ridiculous, too. I had that ordered on my phone before the side finished. Harry also threw on a couple of sides, including an M&K direct to disc version of caravan. Those drums would have melted the cones on a lesser speaker. The table is beautiful and understated, easy to use with its gimbled tonearm, and rock solid and stable in pitch with its direct drive motor. This, to me, has to the direct drive line of tables the same impact that the original Prime had a couple of years ago – extreme value based upon the sum of its parts. And on top of it all, the VPI team served up some tasty food, drinks, and cake! Doesn’t get any better than that! Thanks to Matt and Harry for their hospitality! I am on my third VPI table, and honestly I cannot see owning anything else. I'm with Drew 769. Great vibe and great sound in the VPI room. Thanks to Mat, Harry and the whole VPI team for a great experience. I just love the way the whole crew--including the baby--from VPI comes for these shows. Talk about a family run business!! Way to go guys!! I've seen pics of the new 40 with and without the loop of wire and the connection box. Is it available both ways? Can it be ordered with a phono cable attached and no intermediate connections?